SOURCE: Medical Botany, Containing Systematic and General Descriptions with Plates, of all the Medicinal Plants, Indigenous and Exotic, Comprehended in the Catalogues of the Materia Medica, As Published by the Royal Colleges of Physicians of London and Edinburgh: Accompanied with a Circumstantial details of their medicinal effects and the diseases in which they have been most successfully employed. AUTHOR: William Woodville, M.D. of the Royal College of Physicians, London. PRINTED BY: Printed and Sold for the Author by: James Phillips, George Yard, Lombard Street, London. 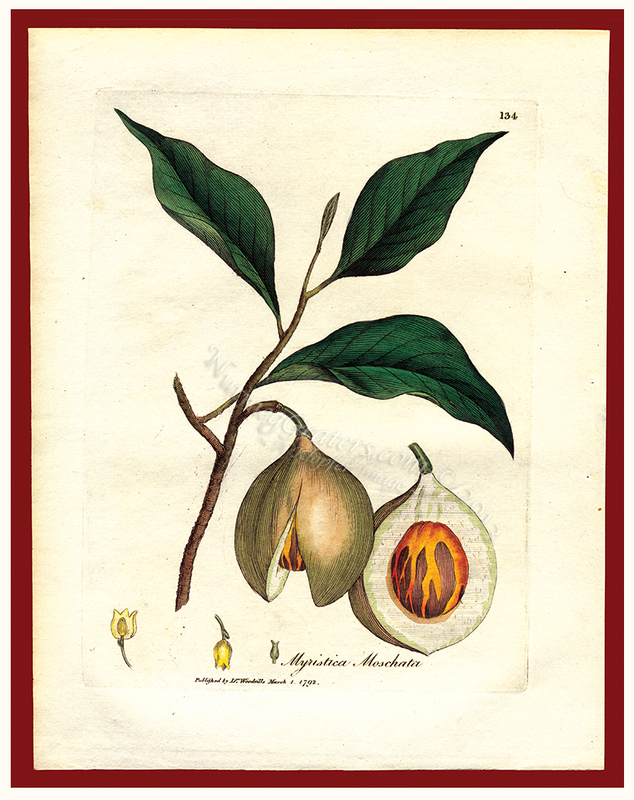 ILLUSTRATOR/COLORER (ARTIST'S NAME): Hand colored by the master botanical illustrator James Sowerby. DATE OF PUBLICATION: This First Edition was published 1790 ~ 1795. DATE OF PRINT: This engraving was published March 1, 1792. PLATE PAGE NUMBER: Plate 134. PAPER TYPE: Handmade wove paper, bearing the water mark: J Larking. 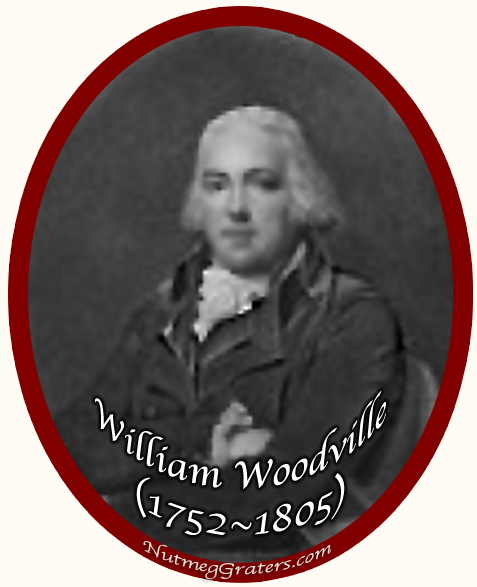 HISTORY: William Woodville (1752 ~ 1805) was an English Quaker physician who created Medical Botany to provide, for his time, the most modern description and illustration of all plants in the Royal College of Physicians list of material medica or plants used in medicine. Medical Botany is described as the earliest physicians desk reference and each plant is carefully described for both botanical and medical properties. The work is a fascinating glimpse into the practice of medicine during the late 18th century, when pharmacopoeia consisted entirely of the use of herbs and plants. This "Myristica Moschata" engraving is from the first edition, published in 1790~1795. All engraving within this text are hand colored by the master botanical illustrator, James Sowerby. Reference: Cleveland's Treasures from the World of Botanical Literature, p 25.